Sometimes you just want a bowl of cereal. Whether it be for breakfast or an any time of day snack a spoonful of crunchy paleo goodness floating in almond milk can really hit the spot. This is a modification of NomNom Paleo’s Tropical Granola recipe. My sister-in-law to be was the first one to create this modification and after enjoying it over the weekend I couldn’t wait to make my own! Preheat your oven to 250°F. 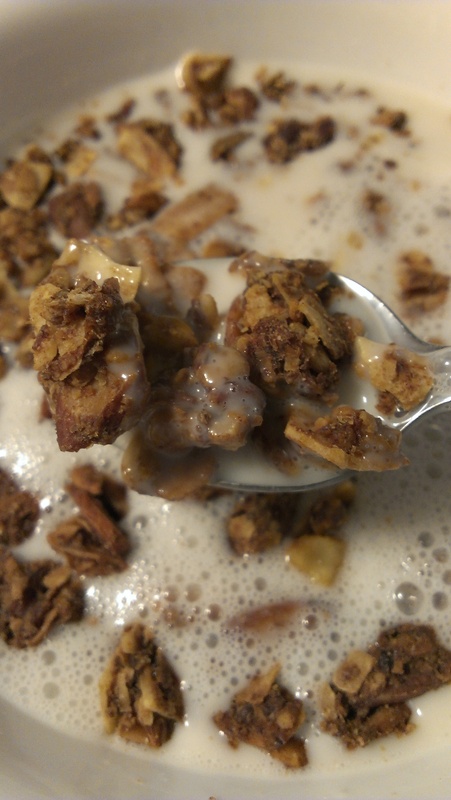 In a large bowl toss together almonds, pecans, walnuts, sunflower seeds, flaxseed, and flaked coconut. Using a 2 cup size glass measuring cup add pineapple tidbits to the 1 cup line then pour juice from the can over the pineapple and up to the same 1 cup line. Add pineapple with juice to your food processor along with dates, vanilla, cinnamon, and salt. Process until smooth. While processing drizzle in your coconut oil. Toss the smooth pineapple mixture with your nut mixture and then spread evenly across 2 baking sheets lined with parchment paper. Bake at 250°F until golden and toasted, approximately 1.5-2 hours rotating racks halfway through. Once cool, if you like dried fruit in your cereal, toss with additional pitted chopped dates or unsweetened and unsulphured dried fruit. If you can’t find any Whole30 compliant dried fruit in your local stores you can order from a great selection at Steve’s Original. I love this recipe best in a bowl with unsweetened carrageenan-free almond milk!